Duluth becomes the second Minnesota city Monday with a commuter rail line to bring people into the downtown. Unlike the multi-million dollar light rail in Minneapolis, Duluth's Lakefront Zephyr is costing taxpayers almost nothing. But it's just running for a week -- long enough, promoters say, to prove it's a feasible alternative to cars. Duluth, Minn. — Some people live in Duluth to escape bigger city annoyances like traffic. For the most part, they can, unless they live in east Duluth. That's where traffic from Lake Superior's North Shore funnels in with city drivers, for what can be a mind numbing, two-lane, three-mile, stop-and-start drive along London Rd. Inese Holte tries to avoid London Rd. on her way to work. She says it's not just the delays. It's the other drivers. "The road rage," says Holte. "People jockeying for position in those lanes. It's just wild." Ken Buehler gets caught in it too. He's the guy who runs the North Shore Scenic Railroad, a Duluth tourist train. On a recent day, Buehler was on board an antique, self-propelled railroad car, known locally as the Budd car. "Sunday night in the summer, I go out London Rd., I have to turn across traffic," Buehler says. "The London Rd. traffic coming back from the North Shore on Sunday afternoon can put you in that turn lane for five to six minutes with your blinker on." The Minnesota Department of Transportation is planning a traffic study for London Rd., to consider things like widening the street, or pushing one lane up a block to Superior St. Buehler says they're overlooking the best idea. "All these things are going to be studied, and not once did they mention that there was a set of perfectly good railroad tracks that extended from downtown Duluth right along London Rd., out to Lakeside, Lester Park," Buehler says. Perfectly good tracks, publicly owned, and used now by the North Shore Scenic Railroad. 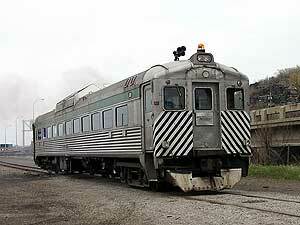 And the railroad has the Budd car, retired after decades of commuter service in Chicago. "I said, 'What the heck? Let's give it a try,'" Buehler says. "Let's show people that these tracks are feasible for commuter service." This week, commuters can leave their cars in a parking lot eight miles east of the downtown, and board the Budd car -- known this week as the Lakeside Zephyr. The Budd car was used for decades for commuter service in the Chicago area. It's self-propelled, with a diesel engine in the middle of the car and operating controls on both ends. The car is named for its manufacturer, The Budd Company of Troy, Michigan. The demonstration is a partnership between the Scenic Railroad and the Duluth Transit Authority. The DTA's Tom Elwell says they've rearranged an east end bus schedule to meet the rail commuters. The train ride will take about 30 minutes. "So that half hour which you'll get on the train will be -- it actually takes 23 minutes to get there by bus," Elwell says. "It (the bus) may pass up the train, we don't know." The DTA's Jim Heilig says the demonstration a good way to promote public transportation, even if the train is a bit more than Duluth needs just now. "Generally, our demand is not quite up to what we would call the heavy rail that we're looking at in this demonstration," Heilig says. "Obviously, if Duluth ever develops like it used to in the old days, or if the demand changes." But demand could quickly change if gas prices keep rising, or especially if there's a return to gas shortages. When gas lines appeared in the 1970s, DTA ridership soared to almost three times the number of riders today. Back on the Budd car, Ken Buehler admits the demonstration is really intended to make a point -- to prove there are other ways to get around beyond cars. "We've got people thinking of other alternatives -- that there is, and could be, a rail component to mass transit in Duluth," Buehler says. A regularly scheduled commuter train is a long way off, even if this week's experiment is a smashing success. "We are stuck at this point, because we can only call this a feasibility and demonstration project," says Buehler. "As soon as we go beyond that, we have all sorts of issues." One issue is handicap accessibility, because the old car was built long before current federal regulations were in place. The Budd car is also the only one like it in town. Maintenance would be a problem for what is basically an antique. But the demonstration could help prove a point. The little train that could, could show that in a future of heavy traffic or soaring fuel prices, even Duluth motorists might be willing to get out of their cars and take a ride on the rails. Is Duluth the best option for climate refugees?